Which book tells the story of the judge Jephthah? RUSSIA and the WAR at the Moment! WHAT'S happened to HITLER? Will Germans get a seperate peace with Stalin? Will Russia fight Japan? - Here's the Plain Truth about the war and world events at the moment! This War may end, in Europe, before the year is over! As this is written that becomes a startling possibility, though it is not probable. Events, now, may happen suddenly, unexpectedly, which will rock the world! 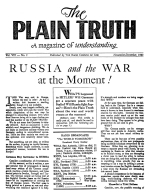 The whole complexion of the war may be changed in astounding manner, even while these lines are being set in type - before you read this number of the PLAIN TRUTH!